Grocery shopping in the city, without a car, is often no fun. If you want to get a full week’s worth of groceries, you’re usually faced with a few options, neither of them particularly enjoyable. You can carry bags and bags of food home in your arms. Or, you can call for a cab, Uber or Lyft, which pushes the price of your shopping trip through the stratosphere. A folding shopping cart with wheels takes the hassle out of shopping when you don’t have a car. Sometimes known as “granny carts,” because they are popular with older people, the carts have lately become a favored accessory of savvy shoppers of all age. That said, some carts are better than others. The last thing you want is to fill up your shopping cart with a week’s worth of groceries and have it lose a wheel or break down on the way home. Here’s how to choose a cart that will last. What separates a folding shopping cart that will last from one that loses a wheel or otherwise breaks on the way home? A few features. When picking out your cart, pay attention to the following. Wheels. You’ll find a range when it comes to the quality of the wheels on a shopping cart. Some wheels are made of plastic and go in just two directions — backward and forward. Other carts have wheels that swivel 360 degrees. That might seem like a small thing, but when you’re trying to turn corners in the supermarket or on the walk home, having wheels that turn makes things a lot easier. The materials of the wheels are another critical consideration. Many inexpensive carts have plastic wheels. That’s not a bad thing, but plastic wheels don’t have the strength of metal ones, nor are they going to withstand the wear and tear of bumpy sidewalks quite like rubber wheels. One other thing to consider when choosing your cart: The arrangement of the wheels. Some carts have just two wheels; others have four. You might find what are called “stair climber” wheels on some models. Usually, the more wheels the cart has, the easier it is to push and pull. Stair climber wheels help you drag the cart up a flight of stairs without having to lift it up off of the ground. Construction and Materials. Some shopping carts look like they will fall apart just by looking at them. Others are much more durable and sturdy. If you regularly have to push 35-pound boxes of cat litter or 12-packs of soda, you’re going to want a cart that can withstand the weight and pressure you put on it. Pay attention to the metal used to build the cart. Steel is pretty sturdy. Aluminum is less so. Run the opposite direction from carts that seem to be made mostly of plastic. Metal Frame vs. Bag. This next one’s a bit of a personal preference. Do you want a cart that’s a big metal box or would you rather get a shopping bag on wheels? There are pros and cons to each. The metal frame carts can often hold more stuff. But that stuff is exposed to the elements on your walk home. Plus, the frames often have wide openings, which makes it easy for things to fall out of the cart while you’re pushing it. On the other hand, having a fabric bag attached to your cart makes it easy for you to protect your purchases from the rain. Often, the fabric is water repellent so that you don’t end up getting home with soaked groceries. The VersaCart Transit Utility Cart seems to combine the best of all possible worlds. It can hold up to 120 pounds of stuff, all in a 21″ x 17″ x 18″ nylon canvas bag. Unlike other carts with a fabric bag, the bag on the VersaCart is in the shape of a cube, which gives it the space of a traditional metal frame cart. The fabric sides keep your purchases from falling out on the way home. It also comes with a lid, so that you can shield your belongings from the elements. Another great feature that sets the VersaCart about from the rest is its ability to fold up compactly. The VersaCart folds shut like an umbrella, so it has a very tiny storage footprint. It’s easy to put together, as its wheels simply snap into place. Wheels are made of plastic. If you’re looking for a cart that will get the job done, without breaking the bank, the Whitmor Rolling Utility/Shopping Cart might be perfect for you. One of the lowest priced options on the market, it’s made from steel and comes pre-assembled. The cart holds a decent amount of groceries, but its carrying capacity is less than the VersaCart. You could probably transport up to 50 pounds of stuff in the Whitmore without issue. The cart’s interior carrying space measures 18 inches by 11 inches. The Polder Superlight Shopping Cart clocks in at just 7 pounds. But don’t let its light weight fool you. This is one sturdy cart. It has front wheels that rotate 360 degrees, making it easy to maneuver and control the cart. The bottom of the frame is made from an aluminum grid. Unlike other carts, the openings between the grids are pretty small, so your purchases are less likely to fall out. 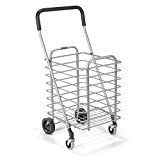 If you’re looking for a good, all around folding shopping cart with wheels, you really can’t go wrong with the VersaCart. It’s easy to use, easy to fold up and tuck away in even the smallest of apartments, and it protects your purchases from rain, snow, and sun.